The VW Tiguan is the best-selling vehicle in Switzerland in July. The Swiss new car market returns to positive territory for the first time since last April with July deliveries up 2.4% year-on-year to 25.483 units, bringing the year-to-date tally to a smidge below it 2017 equivalent at -0.2% to 183.393 registrations. The entire brands podium frankly outpaces the market with Volkswagen up 6% to 12.9% share, BMW up 14% to 8.2% and Audi up 18% to 7.4%. In contrast, Mercedes (-27%) and Skoda (-11%) suffer heavy losses in the remainder of the Top 5. Further down, Mitsubishi (+117%), DS (+79%), Kia (+76%), Subaru (+53%), Seat (+36%), Volvo (+32%), Ferrari (+31%), Peugeot (+27%), Citroen (+19%) and Hyundai (+13%) make themselves noticed. 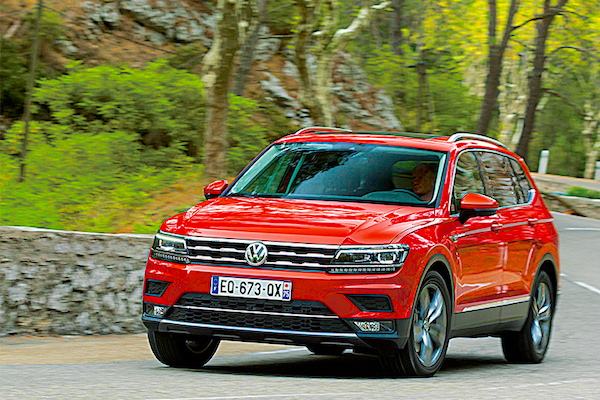 There’s a surprise in the models ranking: thanks to sales surging 66% year-on-year the VW Tiguan snaps a spectacular pole position with 3.1% share, almost one percentage point above any other nameplate in market. It is the second time in the past 20 months that the Tiguan is the best-selling vehicle in Switzerland after November 2016. The VW Golf (-28%) and Skoda Octavia (-22%) follow far below, with the Fiat 500 (+8%), Mini Hatch (+39%) and Dacia Duster (+30%) in tow. The VW T-Roc drops two spots but still stands at an impressive 7th place vs. #17 YTD. The BMW X3 (+120%), Ford Fiesta (+89%), BMW 1 Series (+57%), Audi Q5 (+55%), A3 (+38%), A4 (+38%) and Peugeot 3008 (+32%) also get a mention. Full July 2018 Top 50 All-brands and Top 340 All-models below. Switzerland March 2012: Range Rover Evoque in Top 20!